The Toyota Avalon is a well-regarded and widely driven vehicle, oftentimes seen on the roadways. The team at Grand Blanc Motorcars can provide you with detailed information on the new Avalon features, including performance highlights. The new Toyota Avalon performance features include aerodynamic components, including tangential vents on both sides of the front bumper. The Avalon also includes a rear spoiler and a rear diffuser in addition to underbody panels that increase fuel efficiency. They also reduce interior noise. One of the first things that you will notice about the BMW 6 Series is that it has a very slim design that makes it a wonderful sight. 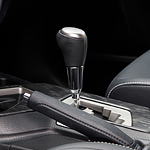 However, a closer look at this type of vehicle will show a lot more to offer for drivers. When BMW was thinking about this series of vehicles, they did not want it to have just one design or body style. There are actually three different body styles which includes the Gran Coupe, ALPINA B6, and Gran Turismo. BMW offers a Certified, Pre-Owned program that provides you with more peace of mind when you’re in the market for a vehicle. At Grand Blanc Motorcars, you can buy with confidence knowing that you’re getting a quality vehicle that has been sufficiently inspected. Often, with used cars, you don’t really know what you’re getting. You can look under the hood and read the odometer, but you don’t have any kind of warranty to fall back on. When your wheels are properly aligned, you can optimize your handling and performance on the road. This can help keep you safe and comfortable no matter what type of conditions you're driving in. As a full-size pickup truck, the Toyota Tundra naturally has a spacious double cabin that can accommodate up to six people. This durable vehicle is available in stylish exterior colors, such as Cavalry Blue, Voodoo Blue, Barcelona Red and Super White. Covered in black and chrome, the front grille of the Tundra has a distinct honeycomb design. Halogen fog lights are installed just below the signature grille. 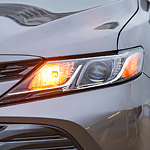 LED bulbs are also included in the powerful fog lights. Available with heating, the power-folding side mirrors have a tilt-down feature. Safety is an important consideration for any new car purchase. But how do you know which features to choose from? Our team here at Grand Blanc Motorcars is here to help with finding the right set of features for your style and needs. Introducing the 2018 Camry, this popular midsize sedan is designed with safety in mind. By using a combination of cameras and radar, your Camry can detect vehicles and pedestrians ahead of you. What do you look for when selecting a new SUV? Is it the performance? What about the features and convenience? Introducing the 2018 RAV4, this popular crossover SUV is designed for a wide range of uses. The suspension system in your RAV4 is designed to provide a smooth ride when driving on your daily commutes. If you take your SUV off the road more often, you can also choose from the sport-tuned suspension system that comes with eye-catching blue shocks. BMW 2017 Profiles In Achievement Award Winners! We would like to say congratulations to our BMW Shop Foreman , Roy "Tom" Gramer on his Gold Level status 2017 Profiles In Achievement Award! Also, congratulations to our BMW Sales Manager, Troy "TJ" Slivka, on his Bronze Level status 2017 Profiles In Achievement Award! It can be more beneficial to be zipping around town in a subcompact rather than something larger. Even though vehicles of this type don't come with all the bells and whistles of their larger brethren, they do bring some useful features to the table. The 2018 Toyota Yaris seeks to be the driver's first choice when choosing a vehicle in this class. When drivers step into the 2018 Yaris, there is a lot for them to enjoy. The fabric-trimmed seats allow drivers to sit comfortably and in style as they navigate points of interest throughout the day. Have you ever wished that you could have a vehicle that would make safe driving even easier than before? With the popular compact hybrid, the Toyota Prius, you can have a vehicle that can help you stay on the road and avoid potentially risky situations.